Preferred way to cite this publication: Department of Primary Industries 2012. East Gippsland Fishery Management Plan. Fisheries Victoria Management Report Series No. 84. The East Gippsland Fishery Management Plan specifies objectives, strategies and actions for managing recreational fishing activities within the Mitchell, Tambo, Snowy and Far East river basins, with a few exceptions. Some of the most popular estuarine fishing in the region is for black bream, estuary perch and dusky flathead in Sydenham and Tamboon inlets and the Snowy River estuary. Popular freshwater fishing includes Australian bass in the Snowy, Genoa and Cann rivers and trout in the Wonnangatta, Delegate, Dargo and Timbarra rivers. The goal of this fishery management plan is to manage recreational fishing in East Gippsland inland waters for at least the next five years in accordance with the principles of ecologically sustainable development. This includes maintaining fishing at sustainable levels, protecting habitats and aquatic environments on which fisheries resources depend and maintaining and where possible improving the social and economic benefits to all Victorians from recreational fishing. Maximise compliance with recreational fisheries management arrangements. DPI to promote community reporting of suspected illegal fishing activities (13FISH). Fisheries Victoria, a division of the Department of Primary Industries, monitors fisheries, assesses the status of fish stocks and works with its stakeholders to facilitate sustainable use of and maximum community benefit from fisheries resources. A key task in sustainable management is preparing and implementing fishery management plans. Fishery management plans are prepared in accordance with the requirements of the Fisheries Act 1995 and specify the objectives, strategies and actions for managing fishing activities in accordance with the principles of ecologically sustainable development and other legislation and policy. Enhancing environmental, social and economic outcomes and the recognition of the importance of fisheries resources to Aboriginal communities are key objectives of effective fishery management and this management plan. This fishery management plan specifies objectives, strategies and actions for managing recreational fishing activities within the Mitchell, Tambo, Snowy and Far East river basins (Figure 1). The estuarine fisheries of Lake Tyers and Mallacoota Inlet are addressed under separate fishery management plans. Key recreational fisheries management issues were identified during the four public meetings held at the start of developing this fisheries management plan. This plan builds on the outcomes of this consultation process, steering committee and other stakeholder input to describe the highest priority strategies and actions to address environmental, economic and social objectives for recreational fisheries management in East Gippsland. The authority to manage the State's fisheries rests in the Fisheries Act 1995, however many factors that influence the State's fisheries resources including land and water management practices, environmental protection and habitat and species conservation, are managed under other legislation. Inland fishery management plans are therefore prepared with a strong focus on establishing partnerships with State and local government, land and water management agencies, representative bodies and other stakeholders. Fisheries Victoria will continue to work with relevant agencies for outcomes that benefit the State's recreational fisheries. This management plan was prepared with the assistance of a stakeholder-based steering committee that included a Independent Chair and representatives of Fisheries Victoria, the East Gippsland Catchment Management Authority, VRFish, Bidwel Traditional Land Owners, Nindi-Ngujarn Ngarigo Monero Aboriginal Corporation, GunaiKurnai and and Waters Aboriginal Corporation Fishing Subcommittee, East Gippsland Shire Council and Parks Victoria (Appendix 1). Further information on recreational fishing is available in the Victorian Recreational Fishing Guide which is available at many fishing tackle shops, at the VFA website or by calling the Customer Service Centre at ph. 136 186. The goal of this fishery management plan is to manage recreational fishing in East Gippsland inland waters in accordance with the principles of ecologically sustainable development. This includes maintaining fishing at sustainable levels, protecting habitats and aquatic environments on which fisheries resources depend and maintaining and where possible improving the social and economic benefits to all Victorians from recreational fishing. Each objective has one or more strategies and actions designed to achieve these objectives. Actions may be refined as additional information obtained from monitoring programs and other sources becomes available. Objectives, strategies, actions and corresponding targets, performance indicators, estimated costs and potential funding sources are summarised in a table in the final chapter of this management plan. Fisheries Victoria will fund the management plan actions required to meet the objectives of the Fisheries Act. Actions not required to meet these objectives will require funding to be obtained from other sources. Estuarine fisheries in the marine waters of Wingan Inlet, to ensure fishing in the estuary is managed in a manner consistent with other small East Gippsland estuaries. This will not change the status of Wingan Inlet as a marine waterway as specified in the Fisheries Act 1995. Fishing activities in marine waters or waters on private land. This fishery management plan came into effect following the Minister's declaration in the Victoria Government Gazette. The plan provides the basis for the management of the East Gippsland fishery for a period of at least five years from the date of declaration. The plan objectives, strategies, actions and performance indicators will be reviewed by the East Gippsland Fishery Reference Group (see below) approximately five years after its declaration to ensure that the plan remains relevant to managing the East Gippsland fishery. Subsequent reviews of the management plan by the reference group will be conducted approximately every five years. The need for a new or amended management plan will be considered following these reviews. An East Gippsland Fishery Management Plan Reference Group will be established by Fisheries Victoria within one year of the declaration of this plan and will meet at least once a year for the five year duration of the plan. The Reference Group will advise the Executive Director Fisheries Victoria on activities and projects that support management plan actions, strategies and objectives, including monitoring implementation. It will facilitate partnerships with other agencies to develop programs, review the outcomes of research and provide recommendations on future research directions. The Fishery Reference Group Terms of Reference will be issued by the Executive Director Fisheries Victoria. Fisheries Victoria will provide the reference group chair and administrative support. It is proposed that membership include representatives of recreational fishers, Traditional Owner groups and relevant government agencies. A report documenting performance against the actions in this management plan will be prepared annually by Fisheries Victoria with assistance from the Reference Group. A final review of the plan will be undertaken approximately five years from the declaration of this fishery management plan. These reports will be made available to the public on the Department of Primary Industries website. East Gippsland has a population of about 42,000 people and the covers approximately 20,800 square kilometres (East Gippsland Catchment Management Authority 2010). The region is characterised by steep forested mountains and a small coastal strip of farmland and estuaries. Approximately 80 per cent of the East Gippsland region is public land, comprised mainly of State Forest and National Park (East Gippsland Catchment Management Authority 2005). The region covered in this management plan aligns with the Mitchell, Tambo, Snowy and Far East river basins. These basins are rated by the Index of Stream Condition 2004 as having the best river conditions in Victoria (Department of Sustainability and Environment 2010). The high proportion of native forests and the absence of hydrological development in the region provides for good water quality, bed and bank conditions, streamside vegetation and aquatic life. These conditions provide important inland and estuarine habitat for recreational fishing species. Recreational fishing contributes significantly to the Victorian economy (Ernst and Young 2009; Henry and Lyle 2003). In East Gippsland it is an important part of the lifestyle of the residents and attracts many tourists to the region. The estuaries in the region are particularly popular with land and boat based fishers targeting black bream, dusky flathead and estuary perch. The individually distinct and ever-changing estuaries provide fishers with a range of impressive fishing opportunities and the remote inland rivers offer a unique wilderness fishing experience for species such as Australian bass and trout. The government funded Enhanced Recreational Fishing Program and the Recreational Fishing Grants Program, funded from the Recreational Fishing Licence Trust Account, has supported many improvements to recreational fishing in East Gippsland in recent years. These programs have helped fund fishing access and facilities, habitat restoration and fisheries research and education in the region. Details of projects and grant application information can be found at the VFA website or in the Victorian Recreational Fishing Guide. The Mitchell is the largest free flowing river in Victoria with no major barriers to fish movement or water diversions that affect natural flows. It is an important example of the large-scale biological systems that were once widespread in south eastern Australia (Land Conservation Council 1990) and is declared Heritage River under the Victorian Heritage Rivers Act 1992. The major headwaters for the Mitchell River are the Wonnangatta and Wongungarra rivers. They are large waterways with usually reliable high annual flow. Most of the basin is steep mountains or hills covered in dense native forest with some small strips of farmland (Tunbridge and Rogan 2002). The Mitchell River flows through cliffs and several gorges, including the Den of Nargun, a site of considerable cultural significance to local Aboriginal people. As the rivers of this basin flow into the Gippsland Lakes, the estuarine fisheries for this basin will be addressed in a separate management plan. Popular inland fisheries in this basin include Australian bass and brown trout in the Wonnangatta, Wongungarra and Dargo rivers. Sea run trout fisheries have been declared on the Tambo River, downstream of the Bruthen Road Bridge and on the Mitchell River, downstream of the Princes Highway Bridge at Bairnsdale. These waters are known to contain self sustaining sea-run trout populations that provide angling opportunities during the closed season. Information on fishing restrictions and regulations associated with fishing in nominated sea-run trout rivers can be found in the Victorian Recreational Fishing Guide. The major rivers of the Tambo River Basin are the Tambo and Nicholson rivers. The principal tributary of the Tambo River is the Timbarra River. The Tambo and Timbarra rivers have reliable flow but the Nicholson River often ceases to flow in summer. The basin is mostly covered by steep forested mountains with some isolated pockets of farmland. The terrain makes access difficult but mountain streams flowing through forest provide for picturesque brown trout and river blackfish fishing (Tunbridge and Rogan 2002). 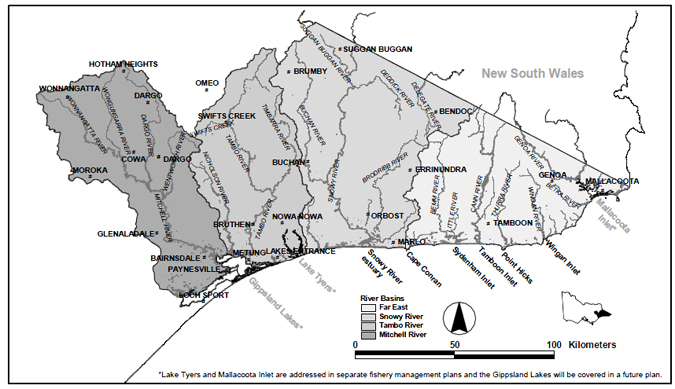 Most of the rivers in the Tambo and Mitchell river basins flow into the Gippsland Lakes and Lake Tyers, estuarine fisheries for these basins are managed separately. Fisheries in the small, mainly freshwater Lake Bunga estuary will be addressed in this plan. The major rivers of the Snowy River Basin are the Brodribb River and the Victorian part of the Snowy River, both rivers flow to the coast at Marlo. Significant tributaries of the Snowy River include the Buchan, Yalmy, Murrindal, Suggan Buggan and Deddick rivers. The basin is almost all forested with some patches of cleared farmland. life. Inflows from tributaries further downstream have maintained reasonable instream conditions in the middle and lower reaches (Tunbridge and Rogan 2002). To improve the ecological health of the Snowy River a comprehensive program of rehabilitation works is being undertaken co-operatively by government agencies, community groups and landowners. These works endeavour to address issues of altered flow regimes, water quality and in-stream, riparian and wetland values. Much of the basin is National Park and although the terrain can make access difficult, it provides fishers with a remote and relatively pristine, wilderness fishing experience. Popular rivers for brown trout and Australian bass include the Bonang, Brodribb, Buchan, Delegate, Little, Queensborough and Snowy rivers. The Snowy River estuary at Marlo is popular with anglers commonly targeting black bream and estuary perch. The Far East River basin contains six major rivers the Bemm, Thurra, Wingan, Betka, Genoa and Wallagaraugh. It contains some of the last substantial blocks of native vegetation in Victoria, nearly 97 per cent of the basin is forested and 99 percent of the lengths of the rivers are in good or excellent condition (Department of Sustainability and Environment 2010). The basin is mostly steep mountains and hills with a small coastal strip of flat farmland and dunes. Rivers in this basin have reliable flow and there are few water diversions (Tunbridge and Rogan 2002). The range of estuaries in this basin provides tourists and locals with a variety of fishing experiences. Some of the most popular fishing is for black bream in Sydenham Inlet, other popularly targeted estuarine species include dusky flathead and estuary perch. Wingan Inlet and Tamboon Inlet estuaries are popular spots for snapper, salmon, tailor, trevally, luderick and mulloway fishing. Popular inland recreational fishing includes Australian bass in the Genoa, Cann and Bemm rivers. The area is isolated and fishing trips often require a four wheel drive vehicle and good maps. Sections of the Genoa, Bemm, Snowy, Suggan Buggan, Upper Buchan, Mitchell and Wonnangatta rivers are all declared under the Victorian Heritage Rivers Act. The region also includes several representative rivers, essentially natural catchments, near pristine estuaries and nationally important wetlands (Land Conservation Council 1990; National Land and Water Resources Audit 2000; Environment Australia 2001). Commercial fishing activity in the inland and estuarine waters of East Gippsland is limited to the harvest of recreational fishing bait species, eels and noxious aquatic species such as carp. Eel fishing is managed through the Victorian Eel Fishery Management Plan (Department of Natural Resources and Environment 2002), which is currently under review. Bait licences are issued in accordance with ecologically sustainable principles. There are no crown land aquaculture licences for the East Gippsland region. Authorisation under the Fisheries Act is required for individuals to engage in any commercial fishing operations including aquaculture. Traditional Owners have an intimate relationship with the East Gippsland region, which stretches back over thousands of years and will continue into the future. The relationship is reflected throughout the region and is based on a long tradition of cultural significance, stewardship and utilisation of fisheries resources. For Traditional Owners, cultural values are intertwined around traditional uses, spiritual connection, ancestral ties and respect for waterways, land and the resources they provide. As a part of the development of the Victorian Aboriginal Fishing Strategy, the Victorian Government has committed to amending the Fisheries Act 1995 to recognise customary fishing. This state-wide strategy will endeavour to establish more effective communication networks with Aboriginal communities and increase the involvement of Aboriginal people in fishing and related industries (Department of Primary Industries (2010c). The Victorian Government and Traditional Owners are also working towards the resolution of Native Title under the Native Title Act 1993. This will help to inform how natural resources, including fisheries, will be managed into the future. Processes exist to provide for traditional ceremonial use of fisheries resources under the Fisheries Act 1995. To find more information on Aboriginal fishing, visit the VFA website. Key recreational fishing species were identified during the first stage of public consultation undertaken in developing the East Gippsland Fishery Management Plan (Appendix 2). The primary estuarine recreational target species were identified as black bream, dusky flathead and estuary perch. The primary inland species were identified as Australian bass and trout. River blackfish, luderick, mullet and spiny freshwater crayfish were also found to be targeted, but to a lesser degree. Black bream (Acanthopagrus butcheri) is an endemic species, which inhabits the estuarine waters of southern Australia from New South Wales to Western Australia. The range of black bream overlaps with the closely related yellowfin bream (Acanthopagrus australis) in southern New South Wales and East Gippsland (Kailola et al. 1993). These two species are morphologically very similar and are known to hybridise in some areas where they coexist (Rowland 1984). Spawning for this species can occur from August to the following January in any given year, but the peak is often in October or November. Bream spawning usually begins later in western Victorian estuaries than in Gippsland estuaries (Cadwallader and Backhouse 1983). Black bream is a demersal species and may be found in association with rocky river beds, snags and man-made structures (e.g. jetties), and may also be caught over seagrass beds, mud and sand substrates (Kailola et al. 1993; Cashmore et al. 2000). They are considered to be opportunistic feeders, with prey items including bivalve and gastropod molluscs, prawns and crabs, polychaete worms and other small demersal fish (Kailola et al. 1993; Cashmore et al. 2000). Dusky flathead (Platycephalus fuscus) are endemic to Australia and are found in bays, estuaries and inshore coastal areas from Cairns in Queensland to the Gippsland Lakes in Victoria (Kailola et al. 1993). Dusky flathead is sometimes confused with the southern bluespotted flathead (Platycephalus speculator), also called yank flathead. The Victorian Recreational Fishing Guide illustrates features distinguishing the two. Dusky flathead may be found residing over mud, silt, sand and gravel beds as well as seagrass beds, predominantly Zostera mulleri. They are ambush predators with prey including other fish (mullet or whiting), crabs, prawns, other crustaceans and polychaete worms (Kailola et al. 1993). Kailola et al. (1993) suggest that dusky flathead populations may have been affected by loss of seagrass, sedimentation and changes in habitat and environment, particularly in east coast estuaries and inlets. Estuary perch (Macquaria colonorum) are resident in estuaries of southeastern Australia from northern NSW through Victoria and Tasmania to the mouth of the Murray River in South Australia (Williams 1970). They are most common in estuaries and freshwater reaches of coastal streams. Estuary perch can grow up to ten kilograms but are commonly much smaller, between 400 grams and 2 kilograms. Examination of fish caught in netting surveys of Victorian estuaries indicated that estuary perch spawn during winter and early spring (McCarraher and McKenzie 1986). Spawning usually begins later in western estuaries than in the east. At spawning time estuary perch are likely to be found over seagrass, algal beds or rocky reefs. At other times of year they are found in a wide variety of habitats ranging from deep channels to shallow mud-bottomed habitat (Nicholson et al. 2008). Estuary perch are ambush feeders preying on small fish, shrimp and prawns. They may also consume worms and bivalve molluscs (Allen 1989). It is a good sporting and eating fish, readily taken on artificial lures and baits such as worms and prawns. The waters of East Gippsland also contain considerable numbers of estuary perch and Australian bass hybrids. It is thought that these hybrids are sterile and there are concerns that large numbers could lead to a population bottleneck in one or both species by lowering the reproductive output of individuals (Jerry et al. 1999). Australian bass (Macquaria novemaculeata) are known to be catadromous migrants with a largely freshwater lifecycle returning downstream to spawn in the estuary. They travel extensively within larger catchments of rivers on the south-eastern coast of Australia. In Victoria, they occur naturally in coastal draining rivers east of Wilsons Promontory. Australian bass are known to reach 57 centimetres in length and 3.4 kilograms in weight, but are most commonly caught between 750 grams and 1 kilogram. It is a carnivorous species, feeding in estuaries mainly on shrimp, small crabs, worms and smaller fish. In freshwater they will feed on insects, shrimps, tadpoles and small fish (Cadwallader and Backhouse 1983). In Victoria, Australian bass migrate to the middle and lower reaches of estuaries during the winter and spring to spawn (Koehn and O'Connor 1990). They are highly regarded by anglers and require a good deal of finesse to catch with any regularity. Light rods and tackle are required and a variety of soft plastics and small bibbed lures are used to target this species. Brown trout (Salmo trutta) are native to the cool waters of Europe and were introduced to Australia in the mid-nineteenth century from Scotland as a recreational sport fish. The ideal habitat for brown trout is cool, well-oxygenated waters such as rivers and streams with moderate to fast flows. They are distributed throughout the cooler waters of the upper East Gippsland Catchment. Rainbow trout (Oncorhynchus mykiss) are native to the Pacific coast of North America and were introduced to Australia in the late nineteenth century from New Zealand where the species had previously been introduced from California. Like brown trout, rainbow trout was introduced to satisfy a sport fishing market and are distributed in the cooler upper reaches of the East Gippsland catchment. Under the Fisheries Act 1995 Fisheries Victoria is responsible for ensuring the sustainable use of fisheries resources in Victoria. The Act provides for the development, implementation and review of fishery management plans. The Fisheries Regulations 2009 prescribe detailed management arrangements for commercial and recreational fisheries, including licence requirements, restrictions on fishing equipment and methods, restrictions on fishing catch and effort (bag limits, size limits, closed seasons and areas), and penalties for breaches of fishing controls. The Victorian Recreational Fishing Guide summarises regulations and is available where recreational fishing licences are sold and online. Fisheries management in Victoria focuses on securing a long-term, high quality natural resource base and generating jobs and other socio-economic benefits for the State's communities. Fisheries Victoria undertakes its role in the context of increasing competition for water and access to fisheries resources and increasing pressures on fish habitats. Establishing clear direction is critical to Fisheries Victoria's ability to effectively manage the State's fisheries resources by developing and implementing policies and projects and delivering a wide range of services. Fisheries Victoria's vision of success is to develop and manage the State's fisheries resources within an ecologically sustainable development framework to ensure fish now and for the future (Figure 2). This vision underpins Fisheries Victoria's projects, policies and services and is achieved with the cooperation and support of the community, industry and other government agencies and within the established legislative and policy framework. In accordance with Commonwealth and State government policies, Fisheries Victoria is committed to managing fisheries in accordance with the principles of ecologically sustainable development (Fletcher et al. 2002). Adopting a precautionary approach to management, particularly for fisheries with limited data. Inland Waters Recreational Fishing Classification: Building Better Fisheries in Victoria (Department of Primary Industries 2010b). Aboriginal Fishing Strategy (In preparation) (Department of Primary Industries 2010c). Fisheries legislation applies to the control of fishing activities. Other activities that may affect fish habitats, fisheries resources and fishing opportunities are managed by other agencies and legislation. Fisheries Victoria will continue to facilitate positive recreational fishing outcomes with these agencies. The Commonwealth Department of the Environment, Water, Heritage and the Arts administers the Environment Protection and Biodiversity Conservation Act 1999 which is the Commonwealth's central piece of environmental legislation. The Act promotes the conservation of biodiversity and provides for the identification of key threatening processes and the protection of critical habitat, listed species, protected areas and communities. The Victorian Department of Sustainability and Environment is Victoria's lead government agency for sustainable management of water and land resources, climate change, bushfires, public land, forests, aquatic pests, ecosystems and cultural heritage under the Flora and Fauna Guarantee Act 1988 and the Water Act 1989. Orbost Spiny Freshwater Crayfish (Euastacus diversus). Potentially threatening processes under the Flora and Fauna Guarantee Act relevant to East Gippsland include alteration to flow and temperatures in waterways, degradation of native riparian and in-stream debris and increase in sediment (Department of Sustainability and Environment 2009a). The Department of Sustainability and Environment has the primary responsibility for the management of aquatic pests in Victoria. The Department of Primary Industries performs a supporting role through the use of various fisheries management tools depending on the circumstance. The Environment Protection Authority, or EPA Victoria, was established under the Environment Protection Act 1970. EPA Victoria, is the control agency for investigating pollution of inland waters, including fish death events, and may direct clean-up action. As a support agency, the Department of Primary Industries may assist EPA Victoria in the event of fish death events. The details of responses by EPA Victoria to fish death events are described in the EPA Fish Death Response Procedure (Environmental Protection Agency Victoria 2007). Parks Victoria is responsible for a range of parks in East Gippsland that are used for tourism, including fishing and are set aside to preserve natural environment, biodiversity and cultural heritage. They include most of the East Gippsland coastline and embrace many estuaries, rivers and streams. These parks include the Cape Conran Coastal Park, Croajingalong National Park, Snowy River National Park, Mitchell River National Park, Errinundra National Park and the Alpine National Park. Through effective environmental and visitor management, Parks Victoria is dedicated to protecting and enhancing the natural and cultural values of the parks and associated waterways. Recreational fishing is permitted in many terrestrial parks and reserves in accordance with prescribed fishing regulations. Information on fishing in specific parks and reserves is available from the Parks Victoria website at <www.parkweb.vic.gov.au>. The Catchment and Land Protection Act 1994 divides the State into ten Catchment Management Authority (CMA) regions. The East Gippsland Catchment Management Authority follows the boundaries of the Mitchell, Tambo, Snowy and Far East river basins. This plan manages fisheries within the boundaries of the East Gippsland CMA. Under the Catchment and Land Protection Act 1994 the East Gippsland Catchment Management Authority prepared the East Gippsland Regional Catchment Strategy 2005-2010 (East Gippsland Catchment Management Authority 2005). The catchment strategy is underpinned by a series of sub-strategies including the East Gippsland Regional River Health Strategy 2005-2010 (East Gippsland Catchment Management Authority 2006). It considers water quality and quantity, in-stream and riparian flora and fauna, fish passage and bed and bank erosion. Fishing is rated as having a high social and economic value and many of the strategy actions have positive outcomes for recreational fishing. Water authorities are delegated under the Water Act 1989 to licence and regulate the extraction of water from rivers, lakes and groundwater supplies for irrigation, rural stock and domestic use. Southern Rural Water is the responsible water authority in the East Gippsland region. East Gippsland Water manages urban water supply and wastewater disposal. The East Gippsland Shire Council covers the majority of the East Gippsland region with the Wellington and Alpine Shires covering the north west portion of the Mitchell River Basin. Local governments incorporate river restoration and catchment management objectives into statutory planning processes, floodplain management, urban storm-water plans and rural drainage schemes. They also facilitate local industries' involvement in river restoration and catchment management activities and provide support for local action groups. The Department of Sustainability and Environment has the lead responsibility for aquatic pests in Victoria. Fisheries Victoria plays a supporting role, taking account of the specific circumstances. An aquatic species may be declared noxious under the Fisheries Act 1995. Returning or stocking live noxious aquatic species to or in Victorian waters is an offence. East Gippsland is relatively free from noxious aquatic species when compared with the rest of the state. Noxious aquatic species that inhabit the region include European carp (Cyprinus carpio) and mosquitofish (Gambusia affinis.). Eastern basins have some populations of goldfish (Carassius auratus) but carp are rarely seen east of the Snowy River. This makes the eastern rivers a high priority region for the prevention of the further spread of carp (Murray Darling Basin Commission 2000). Carp can cause significant damage to aquatic habitats and compete for habitat with native fish species. A small number of recreational fishers target European carp in the region. The Department of Primary Industries contributes annually to carp research through joint projects established by a variety of agencies. Development of sensory attractants for pest fish control. Information on recreational fishing is collected to determine demographic profiles of fishers and the values attached to fishing, including levels of satisfaction with fishing experiences and target species preferences. In small recreational fisheries this information is most cost-effectively obtained through onsite access point surveys conducted over a twelve month period. This information is useful to inform decisions on how to maintain or improve recreational fishing opportunities. No specific surveys have been conducted for fisheries covered by this plan but recent access point surveys conducted at Mallacoota Inlet and Lake Tyers provide an indication of angler values in the estuaries of the region. The Mallacoota Inlet and Lake Tyres surveys showed that that the most popular recreational fishing species were black bream and dusky flathead and that a majority of anglers go fishing for reasons not directly related to catching fish, such as to relax, to enjoy nature or to spend time with family (Conron et al. 2010a). State-wide surveys such as the National Recreational Fishing Survey (Henry and Lyle 2003), Coastal Victoria Recreational Fishing Survey (Ryan et al. 2009) and Fisheries Victoria's Recreational Fishing Survey (Department of Primary Industries 2010) have provided a broader insight into the profile, values and preferences of Victorian recreational fishers as a whole. To collect demographic and attitudinal information on a periodic basis, the small size and dispersed nature of many of these specific recreational fisheries does not make it cost-effective. Sydenham Inlet estuarine fishery, one of the largest and most popular fisheries addressed in this plan has however, been identified as a suitable location for a recreational fishing access point survey. It has a single boat launch facility and only a small number of access points for shore based fishers, making it feasible to capture information. Access point surveys at Sydenham Inlet will also provide an opportunity to collect recreational fishing catch and effort data, including the species and size composition of catches, catch rates and rates of discarding undersized or unwanted fish. Funding to be sought from the Recreational Fishing Licence Trust Account to establish access point surveys of the Sydenham Inlet estuarine recreational fishery to provide demographic, attitudinal and catch and effort information. In consultation with recreational fishing stakeholders, Fisheries Victoria to evaluate possible fishery management actions based on Sydenham Inlet surveys to maintain or improve recreational fishing opportunities and inform decisions in other estuaries where surveys are not feasible. The concept of implementing a closed season for black bream fishing was a popular topic of discussion at public meetings held during the development of the East Gippsland Fishery Management Plan, with a range of views expressed. Some stakeholders were interested in a black bream closed season for specific parts of Tamboon Inlet, Sydenham Inlet, the Snowy River estuary and other estuaries not covered by this management plan. Many other stakeholders indicated that a black bream closed season was neither necessary nor desirable. Reasons for this proposal included perceptions of excessive fishing pressure, ethical concerns about the relative ease with which anglers are able to catch their bag limits during the spawning season and a perception that a closed season would help to build fisheries with increased numbers of large black bream. The most commonly suggested period for a closed season was from September or October through to November. Available scientific evidence does not suggest any significant decline in black bream abundance in any of the estuaries covered by this plan or that stocks are currently under threat from excessive fishing pressure. Fisheries Victoria has for many years effectively used recreational catch limits, size limits and fishing gear restrictions as management tools for black bream fisheries. In particular, appropriate minimum size limits have been found to be the most effective and equitable way to reduce fishing pressure on this species. Importantly, the current legal minimum size for black bream (i.e. 28 centimetres total length) is set well above the size at first sexual maturity for this species (i.e. 12 to 20 centimetres) which provides the opportunity for spawning before fish become accessible to 'catch-and-keep' fishing. Additionally, black bream have a high post-release survival rate. The main difficulty with using a closed season as an additional black bream fishery management tool is that the timing and location of bream spawning can vary significantly, both between estuaries and from year to year within the same estuary. The species has been known to spawn in both riverine and lagoonal parts of estuaries at anytime from August to January with a peak spawning period from October to November. A closure of whole estuaries may therefore need to be in place for four or more months during the peak tourism season to ensure effective protection of spawning fish. This may have undesirable implications for many local and visiting fishers as well as businesses that depend on fishing tourism. However, Fisheries Victoria will continue to monitor the status of black bream stocks and the level of fishing activity to inform future decisions to secure and share access to this popular species. In consultation with recreational fishing stakeholders, Fisheries Victoria to review black bream fishery management arrangements based on monitoring of black bream stock status. Fisheries Victoria recognises that Aboriginal people have a strong connection to country that is central to their culture both traditionally and today. an Aboriginal Fishing Strategy is being developed that will help to shape Fisheries Victoria's approach to addressing native title, customary fishing, economic development opportunities and increasing Aboriginal participation in fisheries management. The Aboriginal Fishing Strategy is expected to apply to all Aboriginal Victorians interested in the use of fisheries resources, including Native Title holders. Fisheries Victoria will aspire to establish meaningful relationships with the East Gippsland Traditional Owner groups and work in a culturally appropriate manner to ensure effective communication. Invite representatives of the relevant Traditional Owner groups to participate in the Reference Group responsible for assisting the implementation of the East Gippsland Fisheries Management Plan. Work with representatives of Traditional Owners, relevant government agencies and other fisheries stakeholders to ensure that policies and mechanisms are in place to facilitate Aboriginal aspirations and continued involvement in fishing and fisheries management. There are established, self sustaining populations of trout in the upper reaches of East Gippsland river basins resulting from fish stockings last century. Fisheries Victoria recognises the high social and economic value of these populations. Significant numbers of Australian bass have been stocked into the Snowy River in recent years. The primarily purpose of this stocking is to ensure conservation of the species in the Snowy River catchment, with the additional benefit of improved recreational fishing. Fisheries Victoria is currently investigating the feasibility of stocking selected estuarine species for recreational fishing purposes in some Victorian estuaries, including those in East Gippsland. The University of New South Wales has been engaged to conduct a feasibility study of potential stocking sites. This report is available at <www.depi.vic.gov.au/fishing-and-hunting>. Additionally, Fisheries Victoria has initiated preliminary discussions with recreational fishers and other interested parties as part of this feasibility exercise. All fish stocking in Victoria is conducted in accordance with the Guidelines for Assessing Translocations of Live Aquatic Organisms in Victoria (Department of Primary Industries 2009a). Stocking plans are developed through the annual Vic Fish Stock consultative process that involves stakeholders, land and water agencies. Annual reports are available at <www.depi.vic.gov.au/fishing-and-hunting>. Fish stocking proposals for recreational purposes are considered annually through the Vic Fish Stock program and successful applications are implemented in accordance with the Guidelines for Assessing Translocations of Live Aquatic Organisms in Victoria. Recreational fishing events play an important role in improving fishing opportunities by getting new fishers involved and teaching them how to fish responsibly. The social and economic benefits of new fishers include increased tourism for East Gippsland and more Victorians involved in healthy outdoor activities. Teaching new fishers responsible practices improves fishing for everyone by helping to ensure healthy fisheries for current and future generations. Every year the Victorian Government, through the Recreational Fishing Licence Trust Account, disburses revenue derived from the sale of Recreational Fishing Licences to projects that will improve recreational fishing in Victoria. This Recreational Fishing Grants Program currently funds up to $5000 for small projects, such as events, to promote responsible recreational fishing practices, improve angling skills and knowledge and increase participation in recreational fishing. The Recreational Fishing Licence Trust Account has helped to fund Fishcare East Gippsland's 'Fish Right' junior angler workshops and 'Catch-a-Carp" day to introduce primary school children to recreational fishing. The account also contributed to The Nicholson Angling Club's 'School Fishing Day'. This event educated junior anglers on correct fishing methods and responsible fishing practices. For more information on the Recreational Fishing Grants Program visit <www.depi.vic.gov.au/fishing-and-hunting> and for assistance with funding applications visit <www.vrfish.com.au>. All events should be undertaken in consultation with relevant land managers. Fisheries Victoria supports applications to the Recreational Fishing Grants Program for fishing events with an emphasis on increasing responsible recreational fishing practices in East Gippsland. Depending on the waterway, the responsibility for providing and maintaining fishing access and facilities rests with agencies such as the East Gippsland Shire Council, Parks Victoria, Gippsland Ports Committee of Management, Department of Sustainability and Environment and Marine Safety Victoria. Several improvements to fishing access and facilities have been made in recent years through the Recreational Fishing Grants Program, funded from the Recreational Fishing Licence Trust Account. Projects include fishing platforms on the Nicholson and Mitchell rivers and a new project to analyse Victorian coastal and estuarine fishing facilities outside of Port Phillip and Western Port bays to determine angler usage levels and un-met infrastructure needs. Streamside fishing platforms and better road and pedestrian access to waterways were raised as the main access and facility matters for the East Gippsland region. Work to upgrade roads and tracks is prioritised by land managers and is based on available funding and the needs of the community. The most effective way to achieve improvements to roads and tracks is to influence the prioritisation process by engaging land managers and providing information on the most valued recreational fisheries. Anglers also commented that they would welcome better information on where access points are, particularly in relation to private property access. VRFish reviewed this issue in Access for Recreational Fishing (VRFish 2004) and made a number of recommendations to improve fisher understanding of access issues across the state. In 2009, Parks Victoria, VRFish and several other stakeholder groups reached an agreement (Parks Victoria and VRFish 2009) whereby existing levels of access for recreational fishing will be maintained where possible and consultation with recreational fishers will occur before significant changes to fishing access are made. See the previous strategy for funding application information. Marine Safety Victoria can also provide funding for new boat or jetty infrastructure through their Boating Safety and Facilities Program www.marinesafety.vic.gov.au. Fisheries Victoria and VRFish will support appropriate applications to improve recreational fishing access and facilities in East Gippsland. Fisheries Victoria will provide advice as required to land management agencies on decisions that may affect access to recreational fishing in East Gippsland. The most popular fisheries in the region covered by this fishery management plan are the estuary fisheries of Sydenham Inlet, Tamboon Inlet and the Snowy River estuary. The most commonly targeted species are black bream, dusky flathead and estuary perch. The primary factors driving variation in abundance of these key fishery target species are likely to be environmental conditions but it is nevertheless important to ensure recreational fishing pressure is maintained at sustainable levels. Ensuring sustainable recreational fishing requires knowledge of fishery trends and fluctuations in year class strength and recruitment patterns of key target fish populations. To date there has been little information collected on the status of key recreational fish stocks in estuaries covered by this management plan. Some angler diary information has been collected on black bream populations in Sydenham Inlet and the Betka River estuary, and on estuary perch in Sydenham Inlet (Walsh et al. 2010).The initial focus of this strategy will be to establish and expand ongoing monitoring of key recreational fishery populations in popular East Gippsland estuaries. Where monitoring indicates a need to review management arrangements, such as catch and size limits, to ensure sustainable recreational fishing, options will be evaluated in consultation with stakeholders across the species range. Monitoring programs will provide a time series of data on age composition, catch rate and size, and thus on the relative abundance of successive year classes of particular species in particular estuaries. This information is required for pre-recruit fish (smaller than the legal minimum size) as well as recruited fish to help predict changes in fisheries and to plan appropriate management responses. Suitable methods to collect the required data include episodic on-site creel surveys, on-going research angler diary programs and fishery-independent scientific surveys. The recruitment of angler diarists is often likely to be the most cost-effective and in some cases, the only technically feasible option, given the nature of these small estuarine fisheries. In December 2009 Fisheries Victoria held the East Gippsland Small Estuarine Fisheries Assessment Workshop. Existing stock status data was analysed and it was determined what further information is required to ensure sustainable recreational fishing. The workshop recommended that the two highest priority species for further research were dusky flathead and estuary perch. Research angler diary programs are a cost-effective method for monitoring black bream populations in small Victorian estuaries (Conron 2004; Morison and Conron 2009; Conron et al 2010a). In the region covered by this management plan angler diarist information has been collected for black bream populations in Sydenham Inlet and the Betka River estuary. Figure 3 shows catch rates for a single research angler diarist targeting black bream in Sydenham Inlet since the early 1970s. Along with analysis of the size and age composition of catches, this data shows that the Sydenham Inlet black bream stock is characterised by large fluctuations in the abundance of successive year classes over many years. The quality of black bream fishing in the estuary is closely related to the production of occasional strong year classes which subsequently enter and sustain the fishery for some years after. Information collected by angler diarists for the Betka River and other Victorian estuaries shows similar characteristics for black bream populations elsewhere. This information provides a cost-effective means of assessing the status of bream stocks in each estuary and determining the sustainability of current levels of fishing. There is a need to expand monitoring of black bream populations to as many East Gippsland estuaries as possible, with priority given to the largest bream fisheries. The establishment of new angler diarists depends on the availability of experienced and highly skilled volunteer anglers who are prepared to target specific species in accordance with prescribed methods, as well as funding from the Recreational Fishing Licensing Trust Account. Fisheries independent methods such as netting surveys are an alternative for ongoing fisheries monitoring, but they additional cost is not warranted given the relatively ;low level of risk in these fisheries. Within three years of declaring this plan funding is to be sought from the Recreational Fishing Licence Trust Account to monitor the status of East Gippsland black bream populations using the angler diary program or a cost-effective alternative, with priority given to Sydenham and Tamboon inlets and the Snowy River estuary . Data courtesy of John Kirk, research angler diarist. In recent years dusky flathead have become an increasingly popular recreational fishing target species in East Gippsland estuaries. The majority of dusky flathead are retained by anglers (Henry and Lyle 2003, Conron et al. 2010a, Kent et al. 2010) and this, combined with the increased use of effective artificial lures and has resulted in greater fishing pressure on dusky flathead stocks. The current minimum size limit for dusky flathead is 27 centimetres total length and the recreational daily bag and possession limit is 5 fish per person, of which no more than one fish may equal or exceed 60 centimetres in length. Research on dusky flathead from New South Wales estuaries (New South Wales Department of Primary Industries 2008) has shown that most female dusky flathead do not reach sexual maturity until 55 centimetres in length. It is thought that dusky flathead first attain sexual maturity at a larger size in warmer waters (Kailola et al. 1993) meaning that dusky flathead in East Gippsland waters may reach sexual maturity at less than 55 centimetres, but this is yet to be confirmed. In recent years recreational fishers have expressed concerns over declining catches of dusky flathead over 50 centimetres in East Gippsland estuaries. Creel and research angler diary data collected in Mallacoota Inlet and Lake Tyers since the late 1990s supports this claim (Conron et al. 2010a, Stokie et al, 2010). It is appropriate to establish monitoring selected East Gippsland estuaries, with priority given to the dusky flathead fishery in Tamboon Inlet. The most cost-effective way of conducting such monitoring would be the recruitment of angler diarists who target dusky flathead in particular estuaries. The success of such a program will depend on the availability of suitable volunteer anglers. To date small dusky flathead have been difficult for anglers to catch and it is not yet clear if research angler diary methods will be suitable for this purpose. Information on pre-recruit fish is important for predicting trends in fisheries. Recent research in Mallacoota Inlet has shown seine netting to be effective in catching small dusky flathead (Kent et al. 2010). Within two years of declaring this plan Fisheries Victoria, in consultation with stakeholders, to undertake a review of existing fisheries management arrangements for dusky flathead. Within three years of declaring this plan funding is to be sought from the Recreational Fishing Licence Trust Account to establish ongoing monitoring of the status of East Gippsland dusky flathead populations using the angler diary program or a cost-effective alternative, with priority given to the popular Tamboon Inlet fishery. To date the information collected for East Gippsland estuary perch fisheries covered by this plan is angler diary data from Sydenham Inlet (Walsh et al. 2010). This data indicates that estuary perch can live more than 40 years and that populations are characterised by relatively infrequent strong year classes. These characteristics may make estuary perch more vulnerable to fishing pressure than other estuarine species. This emphasises the need for cost effective monitoring of stocks status to determine if the species is currently being fished in a sustainable manner. Available evidence indicates that there has not been strong recruitment of estuary perch in Sydenham Inlet in recent years and the abundance of adult fish has declined (Walsh et al. 2010). As a precautionary measure, Fisheries Victoria will undertake a review of existing fisheries management arrangements including bag and size limits and consider conducting a trial stocking program of estuary perch in Sydneham Inlet. It is thought that the natural closure of some estuaries during periods of low catchment runoff, preventing tidal inflow, may have marked effects on the breeding success of estuary perch (Department of Primary Industries 2007b). This may be affecting the estuary perch fisheries of East Gippsland where local residents have reported extended closure of estuary mouths in recent years, including Sydenham Inlet. As with dusky flathead pre-recruit estuary perch have been difficult for research anglers to catch, and it is not yet clear if research angler diary methods on their own will be effective for monitoring estuary perch populations. Research netting in Anderson Inlet has recently been demonstrated to be effective in catching small estuary perch (Conron et al 2010b). Within two years of declaring this plan, Fisheries Victoria, in consultation with stakeholders, will undertake a review of existing fisheries management arrangements for estuary perch. Within three years of declaring this plan funding is to be sought from the Recreational Fishing Licence Trust Account to monitor the status of East Gippsland estuary perch populations using the angler diary program or a cost-effective alternative, with priority given to Sydenham Inlet and the Snowy River estuary. Within two years of declaring this plan, Fisheries Victoria, in consultation with stakeholders, will review the feasibility of stocking estuary perch in Sydenham Inlet as a tool for rebuilding fish stocks. Australian bass are present in many of the rivers and streams of East Gippsland. Their habitat stretches from the lower estuarine areas to the upper reaches of these waters. Australian bass is an important recreational species and is popularly targeted by anglers in the Snowy, Brodribb, Cann, Bemm and Genoa rivers. While the details of Australian bass reproductive biology are not yet well understood, it is clear that they require the ability to move freely between estuaries and freshwater areas well upstream in addition to the presence of appropriate spawning cues and suitable habitat at key points in the life cycle. In 2003, it was observed that a number of age classes of Australian bass in the Snowy River were poorly represented and that breeding success had been unreliable over the previous fifteen years. Modifications to elements of the river environment were considered to have been the primary cause. In the years since then, a total of over 400,000 cultured juvenile bass have been released in the Victorian and New South Wales reaches of the Snowy River. This stocking program was undertaken for conservation purposes and was designed to establish additional year classes within the Snowy River bass population by overcoming possible bottlenecks to recruitment such as poor spawning success. While these stockings were not primarily for the purposes of recreational fishing, they do play an important role in supporting the recreational fishery in the Snowy River. There is recent anecdotal evidence suggesting a similar decline in the Australian bass population and absence of specific year classes in the Mitchell River and tributaries. There is a need to better understand this possible decline, the reasons for it and extent of any such effect.
. The dispersed nature of Australian bass fisheries in East Gippsland makes research difficult, but establishing a research angler diary program may be a cost-effective approach. Previous studies of Australian bass populations in the Snowy River have also found mesh netting surveys to be an effective fishery independent survey method. Within three years of declaring this plan funding is to be sought from the Recreational Fishing Licence Trust Account to monitor the status of East Gippsland Australian bass populations using the angler diary program or a cost-effective alternative, with priority given to the Snowy and Mitchell rivers fisheries. Brown trout and to a lesser degree rainbow trout, are targeted throughout the upper reaches of East Gippsland's rivers and creeks. The upper Timbarra, Delegate, Wonnangatta, Dargo and Crooked rivers are all popular for wilderness trout fishing. Trout are particularly susceptible to habitat changes as a result of climate change and drought. It is important to understand the growing impact of these pressures on stocks. It needs to be determined what trout stock status data exists for East Gippsland and if any further research is required to ensure the sustainability of the fisheries. During the life of this fishery management plan, analyse any existing trout stock status data and determine if further research or management actions are required. The sustainability of recreational fisheries resources is dependent on controlling the impacts of fishing on fish stocks and maintaining the integrity of the habitats and ecological processes that support fisheries. The provisions of the Fisheries Act 1995 can only apply to the management of fishing activities. Other activities such as catchment land use, water flow diversions and artificial estuary openings, that may directly or indirectly affect fish habitats and fishery resources are managed by different agencies and legislation. Fisheries Victoria's role is to provide advice to these agencies on the environmental requirements of recreational fish species to inform policies and programs. To be able to provide this information it is necessary to know the links between particular habitat conditions and stocks of key fisheries, current status and historical trends in the condition of critical fish habitats and the main threats to the integrity of these habitats. Fisheries Victoria together with local fishers and government agencies assess fishery habitats in Victoria's eastern minor inlets. Reports prioritise research, monitoring and the analysis of existing data on fisheries and associated habitats (Nicholson et al. 2008). Fisheries Victoria is committed to working with recreational fishers, community groups and natural resource management agencies to identify significant risks to fish habitat in East Gippsland. The following have been identified as some of the major known risks. East Gippsland's fish habitat faces increasing pressure from human population growth associated development.. These impacts can be effectively mitigated when carefully managed. Victoria recently experienced a prolonged drought. Fisheries Victoria has developed the Responding to the Impacts of Drought and its Consequences on Inland Recreational Fisheries policy (Department of Primary Industries 2008b) to help mitigate impacts and give direction to working with other agencies to protect fish habitat. The climate of East Gippsland is also experiencing longer term changes. The last five decades have seen a trend towards increased temperatures and decreased rainfall (Commonwealth Scientific Industrial Research Organisation and the Bureau of Meteorology 2010). Climate change research predicts that East Gippsland will continue to be hotter and drier with more extreme events such as drought, very hot days, bushfires and intense heavy rainfall (Department of Sustainability and Environment 2008). The impacts of current rainfall and temperature changes and possible future climate changes have serious widespread consequences for the integrity of habitats and ecological processes that support Victoria's fisheries. This presents new challenges for fishers and fisheries managers. Fisheries such as Australian bass, trout and river blackfish, which prefer cooler water temperatures, may experience reduced viability in previously suitable areas. Reduced flows could affect river connectivity, estuary openings, spawning cues for fish and have an adverse effect on other aquatic organisms on which fisheries resources depend. Through Fisheries Victoria's Victorian Climate Change Strategy for Fisheries and Aquaculture 2008 - 2018 (Department of Primary Industries 2008c) the Department of Primary Industries will assess the potential impacts of climate change on fisheries and will facilitate adaptation to future challenges and opportunities. Most rivers in East Gippsland do not have major flow diversions. Exceptions include the Mitchell River at Lindenow Flats and the Snowy River Hydro-Electric Scheme. Developed in the 1960s the Scheme reduced the average flow in the Snowy River at Jindabyne to about 1 per cent of the average natural flow. Inflows from tributaries further downstream have maintained lower Snowy flows at approximately 53 per cent of previous levels. In 2000, the Commonwealth, New South Wales and Victorian Governments set targets to return 15 per cent of average natural flows in the Snowy River immediately downstream of Jindabyne Dam by 2009 and 21 per cent of average natural flows by 2012. The amount of water and the timing of diversions are of interest to recreational fishing. Many fish species use seasonal change as cues to stimulate spawning and migration. Volume and timing of water flow can have major impacts on fisheries production. The Victorian Government is currently in the final stages of developing the Gippsland Region Sustainable Water Strategy to secure water for towns, industry, the environment and agriculture. The allocation of water to the environment is called the environmental water reserve and is used to maintain the environmental values of water systems by sustaining biodiversity, ecological function and water quality. The East Gippsland Catchment Management Authority with support from the Recreational Fishing Licence Trust Account has facilitated extensive waterway rehabilitation works in East Gippsland. They have been responsible for log and snag placement in waterways, weeding and revegetation of riparian zones and reducing stock access to waterways. Many of these projects are still underway with works to be completed in the coming years. Evaluations of completed rehabilitation works has confirmed their value as fish habitat for key recreational species (Brown 2005, Hindell 2006 and Stoessel and Douglas 2007). Recreational fishers and community groups have played an important role in improving river health, with the support of grants from the Recreational Fishing Licensing Trust Account and other government funds. Successful projects include the Lower Tambo Landcare Group's bank vegetation works and the Nicholson Angling Club's stock exclusion and in-stream habitat project. Decreased rainfall and flow diversions, has led to more frequent and prolonged estuary closures in East Gippsland. Prolonged closures can impact on water quality, water salinity and the plants and animals that help support estuarine fisheries. It is thought the spawning of estuary perch, Australian bass and prawns and the lifecycles of other species could be affected by extended closures. Potential impacts on fish stocks including fish kills due to changes in oxygen levels. .
Seagrass, primarily Zostera mulleri,Heterozostra tasmanica and species of Ruppia (Blake et al. 2000) provides an important habitat for many key recreational estuarine fisheries in East Gippsland. Community consultation recognised concerns over the disappearance of seagrass in estuaries across the region. This phenomenon is widespread nationally and there is little conclusive research on the trend. Seagrass communities are highly dynamic systems with continual loss and re-growth over time (Blake et al. 2000). Further research would be necessary to determine if the recent reduction in the extent of seagrass is part of this dynamic process or part of a longer term trend of decline. If it is part of a longer term trend of decline the impact on recreational fisheries will need to be considered. Department of Primary Industries continues to work with other agencies on environmental management decisions such as estuary openings and the Gippsland Region Sustainable Water Strategy where they may affect East Gippsland recreational fisheries. Fisheries Victoria continues to support recreational fisher, community and agency projects to improve fish habitat in East Gippsland. The Victorian community expects that fisheries resources will be managed at sustainable levels. The Victorian Fisheries Act 1995 and the Fisheries Regulations 2009 provide the legal framework for their protection. Compliance with the Act and Regulations is critical to Fisheries Victoria's ability to secure, share and increase the value of Victoria's fisheries resources. Encouraging voluntary compliance is the most efficient use of available resources. It is best achieved using education programs that promote shared responsibility for maintaining healthy fisheries for current and future generations. Fisheries Victoria is committed to fisheries education and to promoting ongoing cooperation with fishers. The Victorian Recreational Fishing Guide is a tool used by Fisheries Victoria to communicate Fisheries Regulations to anglers. Fisheries Victoria's education programs are complemented by the community education activities of other organisations including Fishcare. The Fishcare Volunteer program, supported by Fisheries Victoria, has been operating in East Gippsland for over fifteen years. The objective of the program is to promote responsible community attitudes and practices towards fish and the aquatic environment. Additionally, VRFish has developed the Victorian Recreational Fishing Code of Conduct. This document provides guidance to recreational fishers on issues such as protecting the environment, respecting the rights of others, returning unwanted fish to the water and valuing fish caught. The code is communicated to angers through a variety of means including a page in the Victorian Recreational Fishing Guide. VRFish will continue to promote and consider new opportunities for promotion of the Victorian Recreational Fishing Code of Conduct. Fisheries Victoria will continue to support Fishcare East Gippsland and other organisations in the delivery of responsible fishing programs and events. Effective fisheries management is achieved by maximising voluntary compliance with regulations and creating deterrents, including penalty infringement notices and prosecutions. Fisheries Victoria's community education and awareness programs are complemented by routine and targeted boat and land-based patrols conducted by uniformed and plain clothes Fisheries Officers. These patrols provide important opportunities for communication and engagement and discourage illegal activities by providing a physical presence. Patrols are supported by the use of technology and targeted investigations including covert operations to disrupt and dismantle large scale organised crime. In East Gippsland these services are primarily delivered by Fisheries Officers based at Lakes Entrance and Mallacoota. To further enhance these compliance activities, the Department of Primary Industries also operates a 24-hour, 7-day-a-week, state-wide fisheries offence reporting service, 13FISH (ph.13 3474). Members of the public are encouraged to use this number to report suspected illegal activities. 13FISH reports have led to Penalty Infringement Notices, prosecutions and the generation of intelligence reports. As immediate field responses are not always possible, the 13FISH number is often used to gather intelligence to assist in planning patrols, enforcement operations and targeted investigations. Fisheries Victoria to promote community reporting of suspected illegal fishing activities (13FISH). Fisheries Victoria compliance staff undertake compliance programs based on state-wide priorities, identified resource risks, 13FISH reports, use of technology and information from community consultation. Allen,GR 1989, Freshwater fishes of Australia. TFH Publications Inc. Brookvale, Victoria. Blake, S, Roob, R and Patterson, E 2000 Seagrass Mapping of Victoria's Minor Inlets. Marine and Freshwater Resources Institute Report No 28. July 2000, Marine and Freshwater Resources Institute: Queenscliff, Victoria. Brown P 2005, Use of rehabilitated freshwater and estuarine habitat by recreational fish, Recreational Fishing Grant Program research report, Department of Primary Industries, Snobs Creek, Victoria. Brown P 2009, Australian bass movement and migration in the Snowy River, Recreational Fishing Grant Program research report, Department of Primary Industries, Snobs Creek, Victoria. Cadwallader, PL and Backhouse, GN 1983, A guide to the freshwater fish of Victoria, Victorian Government Printing Office, Melbourne. Cashmore, S, Conron, S and Knuckey, I (eds) 2000, Black Bream – 1998, Fisheries Victoria Assessment Report No. 24. Marine and Freshwater Resources Institute. Queenscliff, Victoria. Conron S 2004, Recreational Fishery Management Controls of Commercially Important Species. FRDC report 98/146. Marine and Freshwater Resources Institute, Queenscliff, Victoria. Conron S, Bridge N, Grixti D, Ward M and Stokie T 2010a, Monitoring estuarine fish stocks in Anderson Inlet, Mallacoota Inlet, Lake Tyers and the Glenelg and Hopkins Rivers – Project numbers: 5/05/06/1, 06/07/3 and 07/08/14. Recreational Fishing Grant Program Research Report, Department of Primary Industries, Melbourne. Conron S, Kent J and Hindell J 2010b, Recreational fishery monitoring and fish habitat research needed to facilitate management of the Anderson Inlet Fisheries Reserve – Project Number 5/05/06/1 Recreational Fishing Grant Program Research Report, Department of Primary Industries, Melbourne. Commonwealth Scientific and Industrial Research Organisation and Bureau of Meteorology 2010, State of the Climate, Canberra <www.csiro.au> . Department of Natural Resources and Environment. 2002, Healthy Rivers, Health Communities and Regional Growth; Victorian River Health Strategy, Department of Natural Resources and Environment, Melbourne. Department of Natural Resources and Environment, 2002, Victorian Eel Fishery Management Plan, Department of Natural Resources and Environment, Melbourne. Department of Primary Industries 2006, Mallacoota Inlet Fisheries Reserve Management Plan, Fisheries Victoria Management Report Series No. 36, Department of Primary Industries, Melbourne. Department of Primary Industries 2007, Lake Tyers Fisheries Reserve Management Plan, Fisheries Victoria Management Report Series No. 43, Department of Primary Industries, Melbourne. Department of Primary Industries 2007b, Freshwater Fish of Victoria: Estuary Perch, Department of Primary Industries, Melbourne. Department of Primary Industries 2008a, Fish Stocking for Recreational Purposes, Department of Primary Industries, Melbourne. Department of Primary Industries 2008b, Responding to the Impacts of Drought and its Consequences on Inland Recreational Fisheries, Department of Primary Industries, Melbourne. Department of Primary Industries 2008c, Victorian Climate Change Strategy for Fisheries and Aquaculture 2008-2018. Fisheries Victoria Management Report Series. Report No. 66, Department of Primary Industries: Melbourne. Department of Primary Industries 2009a, Guidelines for Assessing Translocations of Live Aquatic Organisms in Victoria (Version 2). Fisheries Victoria Management Report Series. Report No. 65, Department of Primary Industries, Melbourne. Department of Primary Industries 2009b, Recreational Fishing Licence Trust Account 2009/2009: A report to each house of parliament on the disbursement of Recreational Fishing Licence Revenue, Department of Primary Industries, Melbourne. Department of Primary Industries 2010, Fisheries Victoria 2009 Survey of Recreational Fishers, Australian Survey Research, Melbourne. Department of Primary Industries 2010b, Draft Inland Waters Classification, Fisheries Victoria Management Report Series No. 76, Department of Primary Industries, Melbourne. Department of Sustainability and Environment 2008, The Victorian Climate Change Adaptation Program: Climate Change in East Gippsland, Victorian Government Department of Sustainability and Environment, Melbourne. 28 Draft East Gippsland Fishery Management Plan Department of Sustainability and Environment 2009a, Flora and Fauna Guarantee Act - Listed Taxa, Communities and Potentially Threatening Processes, Department of Sustainability and Environment, Melbourne www.dse.vic.gov.au>. Department of Sustainability and Environment, Melbourne www.dse.vic.gov.au>. Department of Sustainability and Environment 2010, Index of Stream Condition 2004, Department of Sustainability and Environment, Melbourne <www.water.vic.gov.au>. Douglas J, 2010, Estuary perch movement and habitat use in the Snowy River, Recreational Fishing Grant Program research report, Department of Primary Industries, Snobs Creek, Victoria. East Gippsland Catchment Management Authority 2005, East Gippsland Regional Catchment Strategy 2005 – 2010, East Gippsland Catchment Management Authority, Bairnsdale, Victoria. East Gippsland Catchment Management Authority 2006, Protecting and Improving our River Health: East Gippsland Regional River Health Strategy 2005- 2010, East Gippsland Catchment Management Authority, Bairnsdale, Victoria. East Gippsland Catchment Management Authority 2010, Our Region, East Gippsland Catchment Management Authority, Bairnsdale, Victoria <www.egcma.com.au>. Environment Australia 2001, A Directory of Important Wetlands in Australia, 3rd edn, Environment Australia, Canberra. Environmental Protection Agency Victoria 2007, EPA Fish Death Response Procedure, EPA Victoria, Melbourne. Ernst and Young 2009, Economic Study of Recreational Fishing in Victoria, VRFish. Ernst and Young, Australia. Fletcher W, Chesson J, Fisher M, Sainsbury K, Hundloe T, Smith A and Whitworth B 2002, National ESD reporting framework for Australian Fisheries: The 'How To' Guide for Wild Capture Fisheries, Fisheries Research and Development Corporation, Canberra. Henry GW and Lyle JM 2003, The National Recreational and Indigenous Fishing Survey, Final Report on FRDC Project No 99/158, New South Wales Fisheries, Cronulla. Hindell JS, 2005, Movement patterns and habitat preferences of black bream in the Gippsland Lakes, Recreational Fishing Grant Program research report, Department of Primary Industries, Queenscliff, Victoria. Hindell JS, 2006, Fishing for new ways to sustain aquatic habitat,, Recreational Fishing Grant Program research report, Department of Primary Industries, Queenscliff, Victoria. Hindell JS, 2008, Gippsland Lakes dusky flathead tracking project, Recreational Fishing Grant Program research report, Department of Primary Industries, Queenscliff, Victoria. Jerry DR, Raadik TA, Cairns SC and Baverstock PR, 1999, 'Evidence for natural interspecific hybridization between Australian bass (Macquaria novemaculeata) and estuary perch (M. colonorum)' Marine and Freshwater Research, vol. 50, pp.661-666. Kailola, PJ, Williams, MJ, Stewart, PC, Reichelt, RE, McNee, A and Grieve, C (eds) 1993, Australian Fisheries Resources, Bureau of Resource Sciences and the Fisheries Research and Development Corporation, Canberra. Kent J, Hindell J and Conron S 2010, Implementation of management plan for Mallacoota Inlet – study of the fishery and habitat. Recreational Fisheries Grant Program Research Report, Department of Primary Industries, Melbourne. Koehn, JD and O'Connor, WG 1990, Biological information for management of native freshwater fish in Victoria, Arthur Rylah Institute Technical Report, Department of Conservation and Environment, Melbourne. Land Conservation Council 1990, Rivers and streams: special investigation: proposed recommendations Land Conservation Council, Melbourne. McCarraher, DB and McKenzie, JA,1986, Observations on the distribution, growth, spawning and diet of estuary perch (Macquaria colonorum) in Victorian Waters. Arthur Rylah Institute for Environmental Research, Technical Report Series No.44, Department of Conservation, Forests and Lands, Heidelberg, Victoria. Morison AK and Conron S 2009, Black bream 2001: Compiled by the Bays and Inlets Stock and Fishery Assessment Group. Fisheries Victoria Internal Report Series No.12, Queenscliff, Victoria. Murray Darling Basin Commission 2000, Ranking areas for action: a guide for carp management groups, Murray Darling Basin Commission, Canberra. National Land and Water Resources Audit 2010, Australia's Near Pristine Estuaries: Assets Worth Protecting, National Land and Water Resources Audit, Canberra. New South Wales Department of Primary Industries 2008, Wild Fisheries Research Program: Status of Fisheries Resources in New South Wales 2006/2007 Dusky Flathead, Department of Primary Industries, Sydney. Nicholson G, Gunthorpe L, Hamer P 2008, Eastern Minor Inlets Fish Habitats 2001, Fisheries Victoria Assessment Report Series No. 39, Department of Primary Industries, Queenscliff, Victoria. Parks Victoria and VRFish 2009, Recreational Fishing and Park Management Communique, Parks Victoria/VRFish, Melbourne. Rowland, SJ 1984,'Hybridisation between the estuarine fishes yellowfin bream, Acanthopagrus australis (Gunther) and black bream, A. butcheri (Munro) (Pisces: Sparidae)', Australian Journal of Marine and Freshwater Research, vol. 35, pp. 427-440. Ryan KL, Morison AK, Conron S 2009, Evaluating methods of obtaining total catch estimates for individual Victorian bay and inlet recreational fisheries. Final report to Fisheries Research and Development Corporation Project No. 2003/047. Department of Primary Industries, Queenscliff, Victoria. Snowy Genoa Catchment Management Committee 1996,Expert Panel Environmental Flow Assessment of the Snowy River Below Jindabyne Dam, Snowy Genoa Catchment Management Committee, Sydney. Stoessel D and Douglas J, 2007, Brown trout residence in response to riparian habitat manipulation Recreational Fishing Grant Program research report, Department of Primary Industries, Snobs Creek, Victoria. Evaluation of changes to dusky flathead catch limits in Mallacoota Inlet Recreational Fishing Grant Program research report, Department of Primary Industries, Melbourne. Tunbridge B and Rogan P 2002, A Guide to the Inland Angling Waters of Victoria. Department of Primary Industries, Melbourne <www.dpi.vic.gov.au/fishing>. VRFish 2004, VRFish Policy Paper – Access for Recreational Fishing, VRFish, Melbourne <www.vrfish.com.au>. Walsh CT, Gray CA, West RJ, van der Meulen DE and Williams LFG 2010, Growth, episodic recruitment and age truncation in populations of a catadromous perichthyid, Maquaria colonorum. Marine and Freshwater Research 61, 397-407. Williams, NJ 1970, A comparison of the two species of the genus Percalates Ramsay and Ogilby (Percomorphi: Macquaridae), and their taxonomy, New South Wales State Fisheries Research Bulletin No.11. Chief Secretary's Department, Sydney. The following Ministerial guidelines for the East Gippsland Fishery Management Plan were published in Gazette G23 of the Victoria Government Gazette on 10 June 2010. I, Anthony Hurst, as delegate of the Minister for Agriculture, pursuant to section 28(2) of the Fisheries Act 1995 (the Act) and with consideration of section 3A of the Act, issue the following guidelines with respect to the preparation of a fishery management plan for the East Gippsland region. These guidelines supersede the guidelines published on 17 December 2009 for the East Gippsland Fishery Management Plan. Fisheries Victoria of the Department of Primary Industries will be responsible for the preparation of the East Gippsland Fishery Management Plan. This fishery management plan will be prepared with input from all relevant major stakeholders including recreational and Aboriginal fishers. The East Gippsland region includes Wingan Inlet and all inland waters as defined in the Act within the area enclosed by the boundaries of the East Gippsland Catchment Management Authority excluding the waters addressed in the Mallacoota Inlet Fisheries Reserve Management Plan, the Lake Tyers Fisheries Reserve Management Plan or that will be addressed in a future management plan for the Gippsland Lakes. This fishery management plan will identify factors including habitat and environmental conditions which may affect the sustainability of fisheries resources. The fishery management plan may identify actions to maintain or enhance recreational and Aboriginal fishing opportunities. This fishery management plan will specify appropriate management controls with regard to recreational fishing and may recommend options to assist in managing related activities, including the merits (or otherwise) of applying a spawning closure for black bream. The fishery management plan may identify the research requirements and the monitoring and assessment regime needed to support management decisions that ensure the sustainability of fisheries resources. This fishery management plan will include processes for reporting on implementation progress to the Victorian community.